Published 10/14/2012 . Last updated 1/8/2019 . 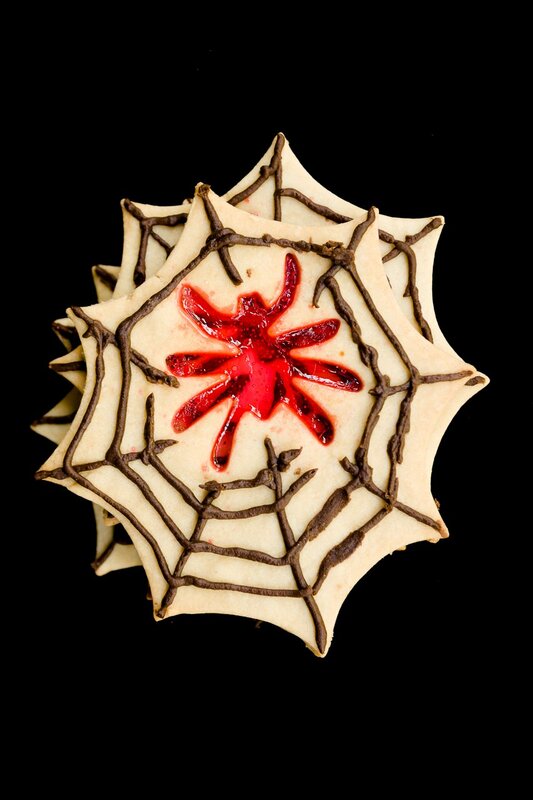 These spider cookies are easy to make and are fun and spooky for Halloween! Thanks to Stefani Crabtree, an archeologist friend of mine, I didn’t miss the news about the first ever fossil evidence of a spider attack. Stefani thought that a spider caught in amber would make for a perfect Halloween dessert idea and she begged me to create a treat inspired by the exciting news. I jumped on the idea! The whole thing is so totally creepy that I couldn’t help myself. To create the effect, I used a technique for making stained glass cookies commonly used at Christmas time (see the stained glass cookie tutorial on King Arthur Flour’s site for an example). You bake a sugar cookie with a hole until it’s just about done. Then, fill the hole with crushed candy and bake again until the candy melts. Use butterscotch candy for an amber look, and take the whole thing one step further by placing a gummy spider in the middle of the hot “amber”. The spider melts just a little bit into the “amber”, which makes it look frozen in time and extra spooky. While I was making stained glass spider web cookies, I also played around with a variety that had nothing to to do with the amber. For the cookie shown above, use a spider cookie cutter to make the hole in the web and fill the hole with red hot cinnamon candy. (I let the candy melt extra long because I liked the way the bubbles looked.) You could make the spider any color you wanted – or even multiple colors – by using different colors of candy. A fun and spooky cookie for Halloween. In a medium-sized bowl, cream the butter and sugar until light and fluffy. Mix in the vanilla, salt, and flour until well-combined. Cover and chill the dough for about four hours. Roll out cookie dough to about 1/4" thick and cut into spider webs. Use the circle cookie cutter or the spider cookie cutter (depending on whether you want the amber look) to cut holes in the webs where the candy will go. While the cookies are baking, crush your candy of choice in a food processor or with a mallet. Place cookies on a cookie sheet lined with a Silpat or parchment paper. Bake cookies with holes for six minutes. Remove the cookies from the oven and fill the holes with the candy pieces. Bake for two more minutes or until the candy is melted and the edges are brown. If using gummy spiders, place gummy spiders on the “amber” as soon as the cookie is removed from the oven. They should melt a little bit into the “amber”. Set cookies on a cooling rack or the counter to cool. Once cookies are cool, pipe webbing onto the cookies using your frosting of choice and a small round piping tip. Very neat! I love the look of the spider in the middle. And totally doable! You did a GREAT job. I hope your friend likes them. What a fun idea. I’m tempted to try it with edible paper and edible markers to make the spider. A good weekend project. Would love to see how using edible markers turned out for you, Lianna! Share with us on twitter or Facebook. Love the cookies. They really bring the whole Halloween theme together and i’m sure the kids (and adults) will love it! I have just discovered the world of cupcakes and I love your blog. Peace and all good things for you in baking and in life.